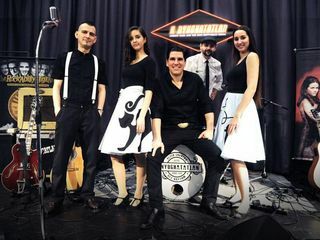 The "A Nyughatatlan" band Formed in 2010. The film about the life of Johnny Cash inspired by the band's name (Walk the Line), so the style of Johnny Cash and the best of rockabilly songs are determining the concerts. They published three albums, and more live videos to repeat the Hungarian public broadcaster. Their first album came to Johnny Cash's best compositions, the second and third and their album was recorded in own compositions. They own our songs in different musical styles mixed with what's called Alter Country.